Much like my favorite video game characters of yesteryear – Pac-Man, Mega Man, and various other -men, really – I find myself always looking for that elusive power up that will give me extra distance on the course. It’s the plight of the noodle arm. While Mario had his magic mushrooms and various NBA players could catch fire, I rely on discs with lower profiles and more glide to make them carry further down the fairway. As a result, even the “slow” discs in my bag aren’t really slow, as the putters and midranges in my arsenal are on the longer side for their respective speed classes. These discs offer plenty of benefit off the tee, as they often times get me in closer range for birdie. But lately I have been having trouble with them when it comes to dialing them back and using them against their nature: to power down. Especially in that intermediate approach range – too long for a putt, too short for a full reach-back-and-throw – these faster molds give me grief. If I don’t get just the right power-to-spin ratio, they’re fading out hard or blowing by the basket. The result has been fewer easy pars and more general frustration. 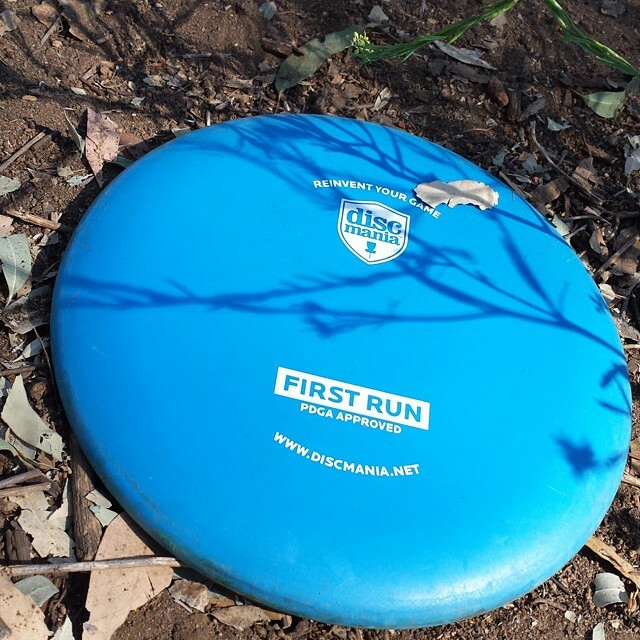 The Discmania P1x makes for a reliable, accurate approach disc. Enter the Discmania P1x, panacea to these ills. The fourth release in the company’s putter stable, the P1x is the first Discmania chain rattler to feature a bead. The addition was the result of “a lot of requests,” according to the brand’s press materials, providing a new feel to a familiar, straight flight. Available in both D-Line (base) and X-Line (rubberized, more durable base, but not premium) plastic blends, the P1x also sports a convex lower wing, which almost gives the disc a football-shaped profile. It fits in the hand nicely, with a feel that is somewhere between the sleek, low-profile ergonomics of modern putters and the deep dish design of their old school brothers. My first experience with the P1x came in the form of a 172-gram blue X-Line. As opposed to its wing, the flight plate of this disc molded up concave, which is a feel I personally enjoy in a putter. Something about it makes me feel more powerful – almost like I went all “Hulk smash!” on the top of the disc and made the impression myself – and in control of the flight. The X-Line plastic provided plenty of grip and a dense feeling, if that makes any sense; it certainly did not feel like it was going to get tossed around in any wind, and the sound it made when it hit the chains for the first time was one of authority. After a short initial field session, I decided to throw the P1x to the fire and give it a one-disc round audition at Brengle Terrace Park. I knew going into this adventure that I’d miss some distance off the tee, but that the trade-off of learning the mold in and out was worth a higher score for the day. Within two holes, I could immediately see the differences between the P1x and my normal putters – either an MVP Atom or Dynamic Discs Judge, depending on the day – and how I could use it to benefit my game. My favorite quality in this disc, though, isn’t its propensity for Swiss Army knife tactics. Instead, it’s how reliable it is for placement and accuracy. Hole 2 at Brengle Terrace is short – the course sign claims 266 feet, but it plays slightly downhill – and takes an easy putter drive to put you in range for a birdie. Lately, I have been throwing this shot from a standstill with the Atom, putting it on a hyzer line to hit on the hillside leading up the basket. Unfortunately, the Atom is so long for a putter that I am often overthrowing it by about 40 feet, or poorly powering it down and leaving me short. It’s that same in-between kind of shot that has been a recent malady in my game. Feeling the P1x would be slightly slower due to its deeper profile and beaded design, I decided to run my drive straight at the pin on a flat throw. It displayed impressive high speed stability to fly a slow, floating line and skip up under the basket for an easy birdie. That shot, I quickly learned, is the P1x in a nutshell. The Discmania P1x (top) sports a bead and a convex wing. 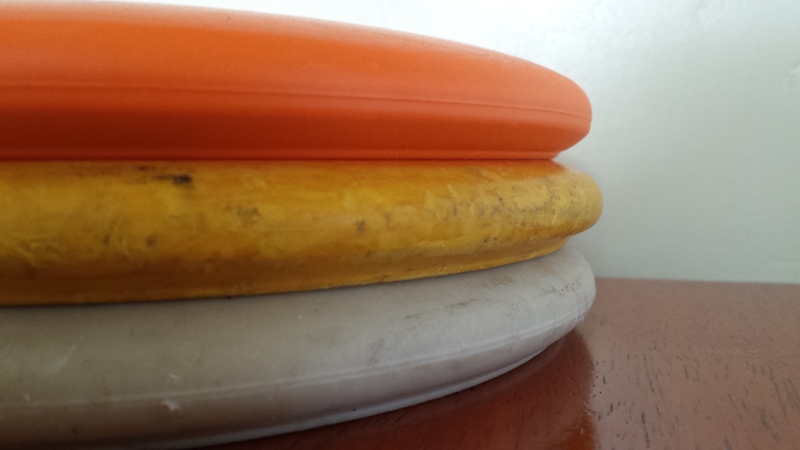 Its height puts it in between the low profile of the Dynamic Discs Judge (middle) and Gateway Wizard (bottom). I was so impressed with the disc after that round that I decided to pick up a D-Line for comparison, just to see if it exhibited any high speed turn or worked in a different gear. Despite a slight difference in the flight plate – the D-Line has more of a flat than concave top – the two iterations fly virtually identically for me. That kind of consistency is comforting. Off the tee, I can make both P1xs hold a hyzer line with clean snap. Give it some more oomph, and you’ve got a nice flip to flat line with very little wiggle. Give it an anhyzer release, though, and it’ll hold to the ground. It’s quite versatile. The bead on the P1x really slows it down compared to my other putters, which makes it much easier to range. Practicing out at my local park, I was planting upshots left and right with barely a thought. On the course, I can loft it on a slight hyzer with a little nose up and have it sit down nicely for a tap-in putt, or even give it a sloppy forehand approach around a tree to hit and stick. Where I really find it is most useful, though, is on jump putts. I like to use these approaches when I am anywhere from 40 to 100 feet away from the basket, due to the aforementioned powering down problems. With the P1x, I can give the basket a straight run off of a jump putt, and the disc rides a slight s-curve with an easy drop at the end of its flight. I haven’t banged a long approach with it yet, but I clanged one off the number plate last week, and any other approaches with it have left me with short comeback putts. No more yelling “sit down!” at my approaches, only to cringe as I see I am left with a 30-plus-footer to try and save par. I will say this: I have not been able to click with the P1x for putting duties. It certainly feels good in the hand, but the same slow speed I love for approaches does not work for my putting style in the circle. I felt like I had to put more on it to get it sink in the chains, and this caused me to open my shoulder and pull my putts left. Or, I would end up lofting it too high, and it would hit near the top of the chainset and come fluttering out. This isn’t to say it won’t work for other people; it just isn’t going to be that putter for me. As it stands now, though, the P1x is my main approach disc – a slower, controlled complement to my faster in-the-circle putters. This may not be the most conventional approach to bagging putter molds, but it is shaving strokes off my game, like a fine plastic razorblade. If that’s not enough of an endorsement, I don’t know what is. Great review as always, Steve! Grab an S-Line P2 for your next review! P2 holds up VERY well when thrown hard.